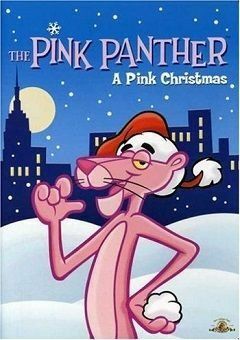 The Pink Panther is homeless and wandering a big city at Christmastime. Snow is on the ground and he is very cold and hungry. The cartoon follows his efforts to obtain food while overcoming a lot of crazy holiday mayhem in town. A chance discovery of a Santa suit leads to a job in department store as Santa, but when he takes a bite out of a little girl’s gingerbread man he is chased by the department store manager. Among several other attempts of finding food, he also attempts to earn money by shoveling the snowy stairs of a nearby house and to get himself arrested in order to get a meal in jail (a plot point borrowed from O. Henry’s classic story “The Cop and the Anthem”), but his efforts are thwarted at every turn. After witnessing a robbery attempt with a police officer nearby, Pink chases after the cop’s dropped doughnut which is rolling down the street. There, a little dog who is also hungry takes the doughnut, but Pink pushes him away and takes it for himself. After seeing the look on the little dog’s face and realizing that his actions are not in line with the spirit of Christmas, the Pink Panther is ashamed of himself, and shares the doughnut with the dog. Then the Pink Panther goes back to the city park and the dog follows him. Suddenly, a little tree just beside the bench they sit on (the same bench that the panther sat on at the start of the special) magically becomes covered with candles and ornaments, followed by a big table with an ample Christmas dinner magically dropping from the sky. Pink looks up to see that Santa has dropped the food, a reward for the panther’s act of kindness toward the dog. He shares the dinner with the little dog and they both begin eating happily.